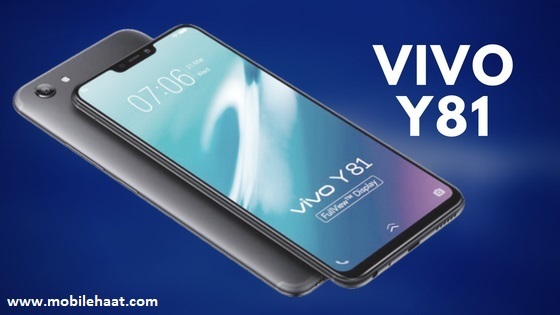 The Vivo Y81 is equipped with a typical stylish iPhone X display and design. On the one hand, you have a stylish look at a very affordable price, but on the other hand, the phone is made of plastic. So, you won't have the feeling of a premium iPhone. But with 88% of the screen to body ratio, a very narrow bezel, and a 6.22-inch large display will be comfortably placed in your hand while giving you a very large view. HD + IPS LCD quality will also ensure a quality viewing experience. Then there is the 13 MP rear camera. It is full of facial beauty, PDAF, bokeh, portrait mode, live photo, slow motion and more. With Vivo Y81, photography is definitely fun. But the 5 MP front camera may be slightly better. In fact, we think this is the biggest drawback of this fascinating phone, as well as a plastic body. Although the front camera also supports all software-related features of the rear camera, such as AI facial beauty, bokeh, portraits and more. The battery should support your regular use for up to 1.5 days. With face access technology, you can unlock your phone with instant face recognition. Smart Split mode lets you split your screen into two parts to help you multitasking. These are the highlights of the Vivo Y81. Performance wise, The gadget is quite fast and totally worth for the price. Internet browsing, video viewing, app usage, games, and more can all be done smoothly. Network Scope: 2G, 3G, 4G (LTE). Operating System: Android Oreo v8.1 (based on Funtouch OS 4.0). Graphics Processing Unite (GPU): PowerVR GE8320. Body: 155.1 x 75 x 7.8 millimeter. Weight: 146.5 grams (Plastic body). SIM Card Type: Dual SIM (Nano-SIM, dual stand-by). Sensors: Accelerometer, proximity, compass, gyroscope, ambient light. Display Resolution: HD+ 720 x 1520 pixels. Display Protection: IPS LCD 19:9 ratio Full-View screen with Corning Gorilla Glass protection. Camera Resolution (Back): 13 Megapixel. Camera Factors (Back): Phase detection autofocus (PDAF), LED flash, face detection, HDR, panorama, AI face beauty, portrait mode, bokeh, live photo, f/2.2. Camera Resolution (Front): 5 Megapixel (f/2.2 aperture). Memory Card Slot: MicroSD, up to 256 GB. Battery Type & Performance: Lithium-polymer 3260 mAh (non-removable). Video Recording: Full HD (1080p). MP3, MP4, FM Radio, GPRS, Edge. WLAN: Yes, Wi-Fi Direct, hotspot. Special Features: Face Access - Smart Split.